There are too many cool new features in each of these products to list them all out (I recommend you check out the release notes for each product). Though, two new features that I would like to point out is from latest vSphere Infrastructure Navigator 2.0 release (also known as VIN) which allows you to export the VIN data to CSV output as well as exporting the maps to PNG. 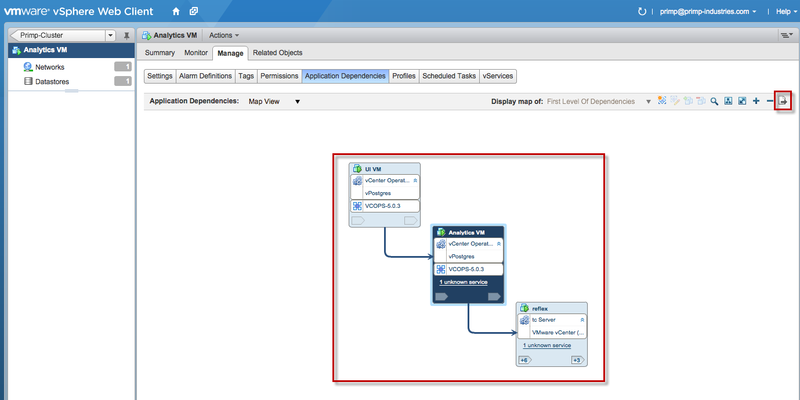 You have the option of exporting all virtual machines from a given vCenter Server or filter out a subset of the virtual machines by navigating to a specific object using the object navigator in the vSphere Web Client. In the screenshot below, I would like to export all virtual machines that VIN is collecting for a particular vSphere Cluster, so I select the Virtual Machines in that Cluster on the left and then select the Manage tab and then click on Application Services. Note: If you filter the list of virtual machines using the Filter box, the export will still capture all virtual machines under this view. If you wish to capture a specific set of VMs, you will need to use the object navigator to filter out the specific objects before exporting. To export the application dependency maps from VIN, you will need to be in the context of an individual virtual machine and again under Manage tab and then click on Application Services. The map export button is located right next to the zoom in/out option in the upper right corner as shown in the screenshot below. I really like map export feature as you can sit back and let VIN do all the hard work of mapping out all the applications and VM dependencies for us in a graphical manner and then just export the picture which can then be used with documentation, CMDB diagrams, auditing, etc. These are just two out of the many new features found in the latest release of VIN 2.0. I highly recommend you give VIN a try if you are not already using it in your vSphere environment! Hi Will, is there an updated version of this process for VIN 5.8.5?